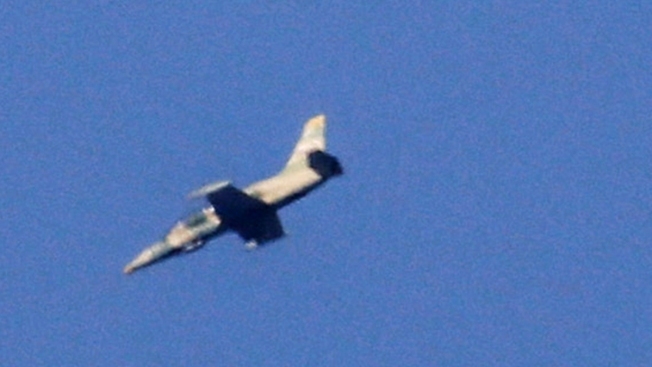 This Monday, July 23, 2018, file photo shows a warplane that's part of Syria's offensive into the rebel-held province of Daraa as seen from the Golan Heights in Israel. Israel has been on high alert since June 19, when Syrian government forces launched the Russia-backed offensive to retake Quneitra and Daraa, which are adjacent to the Israeli-held section of the Golan Heights. Israel shot down a Syrian fighter jet it said had breached its airspace on Tuesday while advancing Syrian government forces retaking territory from rebels reached the Golan Heights frontier for the first time in seven years.